At the corners of fragile smiles, the intersections of furrowed eyebrows and the rolling stops of scrunched and laughing noses, artist Francis Montillaud hopes to find the essence of Elgin Street. The Montreal-based artist began a five-month residency with the city of Ottawa in January, at the end of which he will create a permanent public art installation to adorn the sidewalks of the soon-to-be refurbished area of Centretown. A far cry from the bronze busts of military and political leaders that adorn the north end of the street near the National War Memorial, Montillaud’s work will replicate the intricacies of the everyday. In the first weeks of December, the sculptor conducted “silent, gestural interviews” with residents, neighbours and passersby on Elgin Street to examine their expressions and selected several individuals to be smothered in plaster, moulded, and immortalized in bronze. The final result, to be unveiled in summer 2020, will balance the monumental with the mundane as it celebrates the uniqueness of the Elgin Street locals. “The goal is to have the people be the base material for this piece,” he said. For Ottawa artist Marisa Gallemit, the city’s own creative voices sometimes struggle for breath in a town more often cited as a warehouse for the country’s best historical works, often at the expense of its own thriving artistic communities. Gallemit has lived on Elgin Street for more than 20 years. She’s created art on the road, raised her family there and now she’s helping Montillaud capture her neighbours’ expressions by serving as an entrée for the artist into her community. Montillaud’s residency is being paid for out of the construction budget for the major road overhaul in the neighbourhood. For every infrastructure development in the city more than $2 million, Ottawa allocates one per cent of the total construction cost to public art projects. Montillaud’s endeavour will use the $150,000 to create and install the new exhibit. 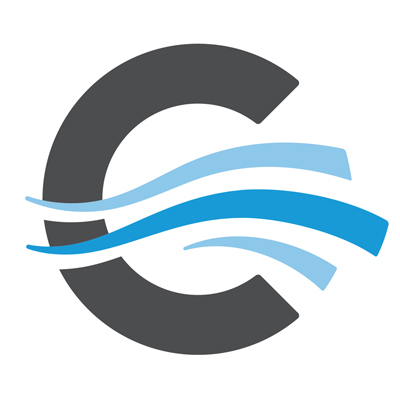 To bring accountability and engagement to its creative spending of tax dollars, the city has decided that for Elgin Street, the community ought to be involved in the project too. “The main emphasis [with the residency] was to create a permanent public artwork for Elgin Street that was really connected to the place, of the people and of the community,” said Melissa Black, public art officer for the city of Ottawa. Black said she sees Montillaud’s plan to use the faces of his random “interviewees” in the final displays as an ideal fit for the city’s goals for public art. Where every unique wrinkle, pimple and dimple of those moulded faces will be part of the final casts, people will be able to “quite literally see themselves in it,” she said. That’s what drew Gallemit to the project, too. Montillaud’s plan to so vitally integrate representations of her neighbours in the final art pieces is not far from her original vision that she pitched to the city during the application process last April. Gallemit’s idea would have seen the creator host pop-up art-making sessions in lobbies of businesses, community centres and churches along Elgin. The “quick art interventions” she proposed would have given her a vast collection of community-made art pieces that she hoped to present behind vitrines or sealed in resin along the street. Where Montillaud’s vision uses the community as the base material, Gallemit wanted to make it the artist itself. A creative error in the development of the loopy lighting artwork at the Jack Purcell Community Centre was reported by the Ottawa Citizen in 2014, when a reporter discovered that the badminton racket-inspired light fixtures in the centre’s adjacent park celebrated a different Jack Purcell from Centretown’s own dedicated hockey stick fixer. 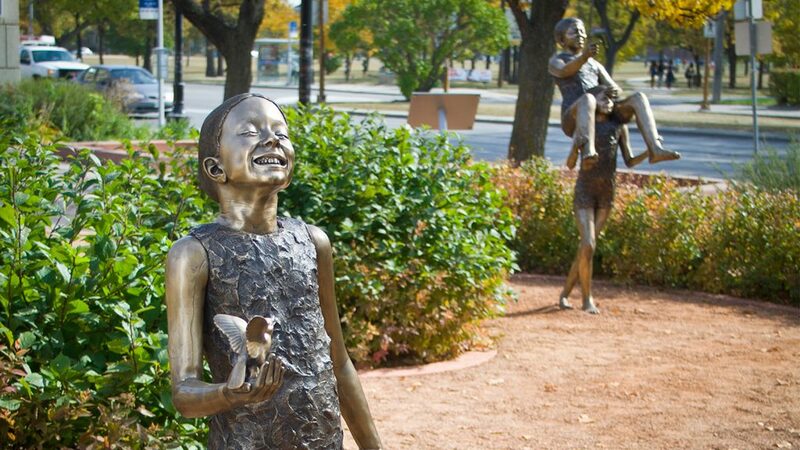 That prompted the city to reconsider how public art pieces would get made. After all, pedestrians can’t opt not to hear Oscar Peterson’s piano riffs when walking by Albert and Elgin Street, nor can passersby not see the towering “Maman” outside the National Gallery at the north end of ByWard Market. Love it or hate it, Gallemit said, public art belongs to everyone. “We’re sort of programmed to believe that art belongs in museums, behind vitrines, in a hardcover book or on a stage,” she said. “The wonderful thing about public art is that it flies in the face of private ownership. “There are homeless people on Elgin, and they’ll be able to interact with these pieces too,” Gallemit added. Montillaud mounted a similar project to his Elgin Street idea in Montreal in 2013. 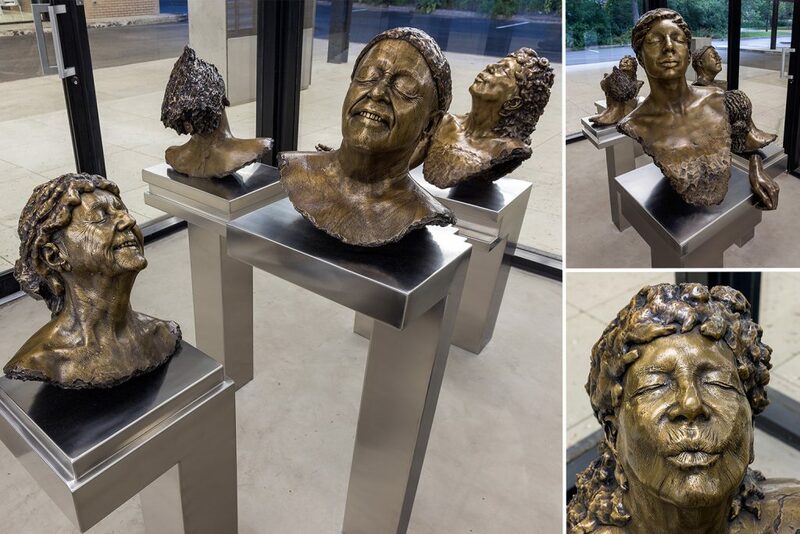 At a gas station-turned-community centre on Nun’s Island, he created five bronze busts made from casts of the faces of youth and seniors who frequented the centre. First, he filmed his non-verbal interactions with the subjects as they were coached through smiles, scowls and other gestures a wide range of gestures. Then, the artist selected his favourites and asked the participants to practice making faces for a week. Volunteers then sat still for ten minutes with closed eyes as hands slathered plaster casts over their heads and shoulders to become immortalized in Montillaud’s creations. “A grin, joy, surprise, fury, suffering, they’re all fairly strong expressions,” Montillaud said. But instead of the perfect replications of those faces, the sculptor became more fascinated by the moments in between. “It was never exactly the expression that they practiced. It’s not faithful to the video, but that can make these final faces even stronger or even a little ambiguous,” Montillaud said. In the muscle quivers that zip across models’ faces during the moulding process, people’s personalities embed themselves into the casts. The final sculptures for the Elgin Street project will be set up in frozen tableaus and scenes along the central stretch of the road past Jack Purcell Park, staged in ways that reflect the interactions Montillaud observes during his residency. “The goal is to make the sculptures bizarre enough to pique interest, but to also allow people to reflect on the way that we interact in a society,” Montillaud said.